The Louisiana Office of Motor Vehicles is a division of Louisiana Public Safety. The OMV, typically called the “DMV” is other states, is responsible for laws, licensing, vehicle registration, renewals and titles for those living in or recently moved to LA. The Louisiana OMV website is fairly comprehensive (http://omv.dps.state.la.us/online_apps.html) with easily accessible links for those looking for a learners permit, written test information, vehicle registration and general forms. Unfortunately, the OMV doesn’t currently offer any online services, such as renewing your license or vehicle, so all OMV related activities need to be performed at an OMV office. As for a motorcycle endorsement (yes, that means you need a regular LA driver’s license), you will be required to take and pass the written, vision, and driving skills tests. You need to take your driver’s license and proof of insurance to a local Office of Motor Vehicles. As for a road test, if you take the “Motorcycle Safety Awareness and Operators Training Program” or the Harley-Davidson Rider’s Edge New Rider Course you don’t need to take a skill test. You need to provide the original certificate as proof of completion. DMVCheatSheets.com offers a variety of options to help you easily prepare for and pass the Louisiana Motorcycle Written Test. Louisiana OMV Motorcycle Cheat Sheet & Online Practice Test Bundle is the most complete and easiest way to prepare for your OMV motorcycle written test. 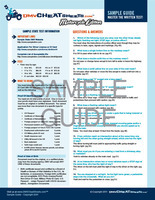 You get our downloadable, printable 3-4 page cheat sheet to take with you to review as well as our online practice test system, featuring 100 multiple choice questions and answers similar to those you will come up against when taking the Louisiana OMV motorcycle exam. Our study material cover every chapter of the LA OMV motorcycle manual including rules of the road, traffic signals, laws, signs and safety.